Our tech campus for RocketSpace is a finalist in this year’s INSIDE World Festival of Interiors in the ‘Offices’ category. 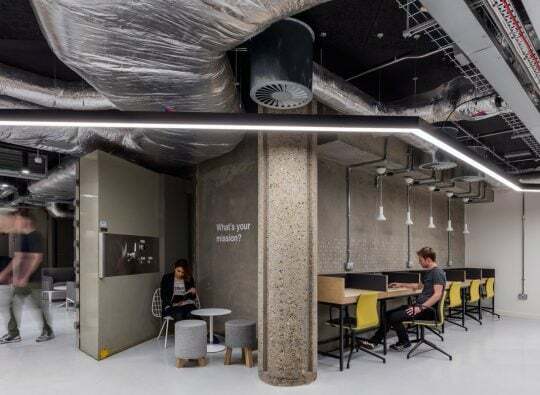 RocketSpace’s co-working accelerator campus in Angel, London, is designed specifically for high-growth tech start-up businesses. The fit-out and restoration at Regents House in Angel, north London, provides RocketSpace with flexible working spaces for up to 1,500. Set over three floors, including a former underground bank vault, LOM’s design strips back the 1980s building to its original shell revealing the structural core of blast proof reinforced concrete, intricate webs of coffered ceilings, and brickwork. Taking place on 15 to 17 November, in Berlin, the INSIDE World Festival of Interiors is a three-day event for interior design professionals and architects. It is the only global interiors festival that combines awards, live judging, conferences and networking providing knowledge and inspiration. INSIDE is the World Architecture Festival’s sister festival which is also taking place at the same time. INSIDE shines the spotlight on the people, projects and developments that are changing the face of global interiors.